Europa Around the World Arcade - download and play. No installation needed. Your objective is to predict whether the next number will be higher or lower total than the last. First, choose the amount you want to wager and click Start. 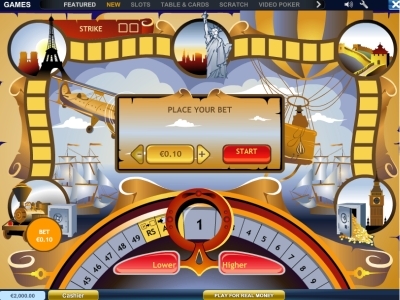 Now the wheel is spun and after the wheel stops, you have to predict the next result by clicking Lower or Higher . Please note that the same number never comes up twice in a row. If you choose correctly, you advance one step. Six steps make one level. If you choose incorrectly, you get one strike. If you already have one strike and choose incorrectly, the game is over and you lose your money. Reaching the end of the level clears your existing strike (if you have one). If you do not have a strike and reach the end of the level, your bet is multiplied by a certain number. If you have one strike and reach the end of the level, your bet is not multiplied (you do not win or lose any money). Before starting the next level you can choose to cash out and end the game, or choose to keep playing. When you reach the end of level 4, you are paid automatically and the game is over.